"Every now and then your kitty might need a little help taking care of herself." Cat grooming techniques are a part of every kitten's life from the first hour he or she is born. The mother licks her kittens as soon as they are born to help them start breathing. So it's no wonder that a cat grooming itself is the most natural thing in the world; something we see every day. However, there are many reasons that you should also groom your cat. Among the most important reasons, grooming your cat helps to prevent hairballs and helps to establish a bond between you and your kitty. Also, long-haired cats just need some extra help to prevent matted cat fur. Not all kitties like to be groomed! If you start grooming your cat from the time she is a kitten, both you and your cat will have a more pleasant experience with the process. Another benefit of regularly grooming your cat (especially brushing your cat) is that it gives you an opportunity to do a general check up on your cat. You can check on the condition of his coat, his skin, his ears, etc. And you can feel for any unusual bumps or lumps. Young kittens are particularly susceptible to ear mites. You can notice changes in your kitten's ears if you are regularly grooming her (the first ear mite symptom is dark brown wax in the kitten's ear canal). You may also want to comb your cat for fleas, if you suspect this is a problem for your kitty. And some people also brush their cats' teeth. My cat, Neko, has had lots of dental issues due to a rough start in her life, so although teeth-brushing would be a good idea, I have not found this to be the easiest thing to do! It's best if you get your cat used to it while he or she is a kitten. However, sometimes health issues make it a good idea to take care of your kitty's teeth. Brushing is the most common way for you to groom your cat. A long-haired cat may need brushing every day to help prevent his or her hair from becoming matted. Brushing your cat is also a way to help reduce the amount of cat fur in your home and on your furniture (a must for people who suffer from cat allergies). It's best to use a special cat brush and other cat grooming tools developed specifically for this purpose. Go to our brushing your cat page for cat grooming tips on this task. Giving your cat a bath is probably the least pleasurable part of grooming your cat. Fortunately, this is usually something that does not need to be done on a regular basis. It's really only for certain unfortunate reasons that cats and kittens need to be bathed. For example, if your cat or kitten has gotten something on their fur that your cat cannot lick away or that you are unable to brush or wipe away with a wet cloth. For more information on bathing your cat, please see our cat bath page for Nine Steps for the Perfect Cat Bath. Of course, cats that participate in cat shows may need cat bathing more often. Here, we're discussing domestic house cats and not cats that need to be groomed for shows. You've probably noticed your cat "chewing" on his or her toenails. They do this to remove the outer sheath of their claws (like when a snake sheds its new skin). This is natural cat behavior. Unfortunately, it usually follows a bit of claw sharpening on our best furniture! To help your cat and to protect your furniture, you should regularly trim your cat's claws. This can be a daunting task for most people because it does involve the possibility of slipping and cutting your cat. Many people prefer to have their veterinarian or a professional groomer take care of this part of cat grooming. However, with the proper cat grooming tools and patience, you can trim your cat's claws without hurting your cat. Visit My Healthy Cat's trim your cat's claws page for all you need to know about trimming your cat's claws. The best time to groom your cat is when your kitty is relaxed and comfortable. Your cat may not have the patience for an entire grooming session. That's alright. Don't force it. You can finish grooming your cat another day. Also, you want to be sure to talk soothingly to your cat or kitten while grooming your cat (no matter which task you are doing). Try to be confident and comfortable. Your cat will pick up on this. After the grooming session, reward your kitty with a play session or occasionally with a healthy cat treat. This helps to reinforce the experience as a pleasurable one for your cat (and for you!). How Does a Cat Groom Itself? 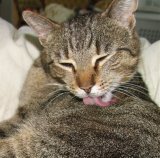 The cat grooming techniques that your cat or kitten uses consists mostly of licking her body and licking her paws to then wipe parts of her body. They can certainly get into some flexible positions while grooming themselves! This is all perfectly natural cat feline behavior. See our cat grooming itself page for more cat health information. However, if you notice that your kitten or cat excessively grooms itself, this could be a sign of a skin allergy, or fleas, or other health conditions. 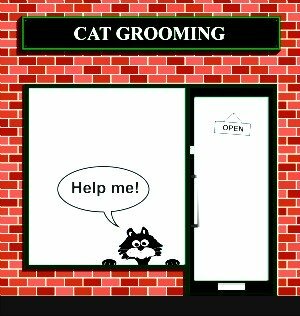 If you notice "cat excessive grooming," you should minimally check for fleas and even better, consult with your veterinarian.